With Ballon shaped flowers before they open it is easy to see how Platycodon grandiflorus gets its common name. 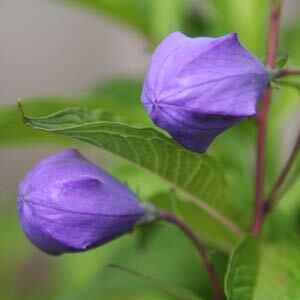 Also called the Chinese Bell flower it closely related to the Campanulas. Emerging in spring the plant will quickly get to around 1m in height and as summer sets in the ballon shaped flowers form. They do open later on to star shaped blooms, however it is the ballon shape that attracts the attention early in the season. 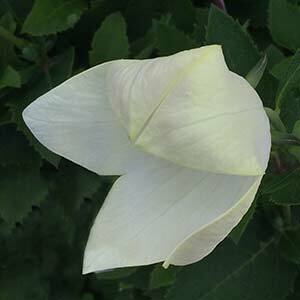 A few new varieties have been released in recent years, with Platycodon ‘Astra’ being one series of merit. Long flowering and with a range of colours from white through to pink and purple, these are a compact cultivar, good foliage and large flowers. Being lower growing and compact they make an excellent choice for containers. Platycodon grandiflorus is a perennial plant that grows well in a sunny to part shaded position in a well drained humus rich soil. Generally a tough plant that requires very little care. Plants are available for sale in winter months when Platycodon or is dormant. Best planted in early spring in a humus rich but well drained soil. As the plants can be rather tall, they may need some support, we like to use hoops that allow the plant to grow through them. At the end of the season allow the plant to die back a little before pruning back to the ground level. Remove spent flower heads, and remember that clumps can be divided in early spring or winter. Flowers of the species are generally a purple color however pink and white cultivars are appearing. These are a plant that do not take well to transplanting or division as they have a longish tap root. Common Name – Ballon flower, Chinese or Japanese Bellflower. Height – Will reach around 60 cm in height, some dwarf varieties are also available.